Cynthia Moe-Lobeda is the keynote speaker this evening at Earth Ministry’s “Celebration of St. Francis: Ecojustice, Social Justice, and the Christian Conscience.” She will be showing a slide of my work “Tree of Life” as a background to her talk. 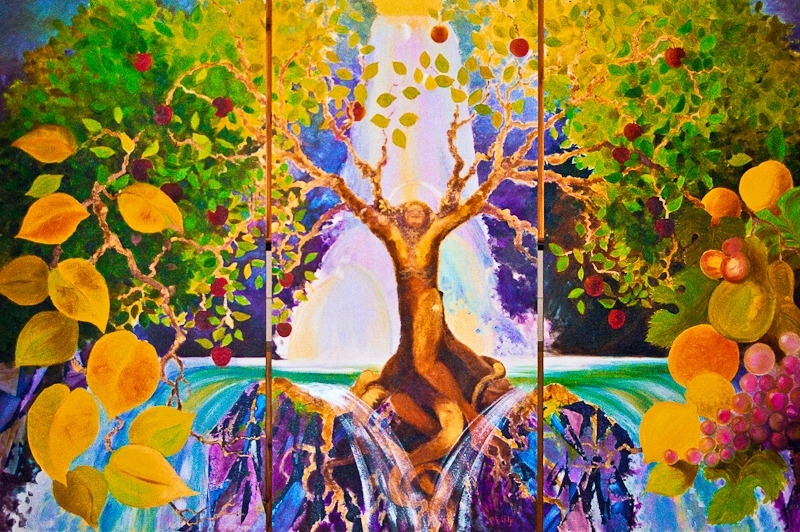 I am honored that my image “Tree of Life” (acrylic on panel, 8 feet by 12 feet, 1999) is the cover art for her book, especially because of the subject matter. I am pleased that my painting is developing a life of it’s own and doing its work in the world. Below is a picture of St. John United Lutheran Church, 5515 Phinney Ave. N, Seattle, WA, where the event tonight will be. 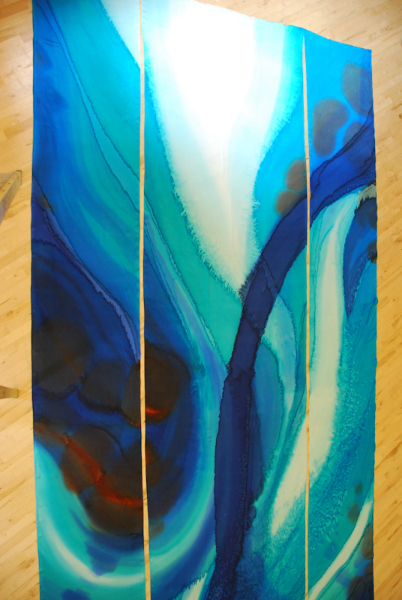 It’s been a very busy summer, but the 36 foot by 8 foot abstract waterfall project is just about finished. 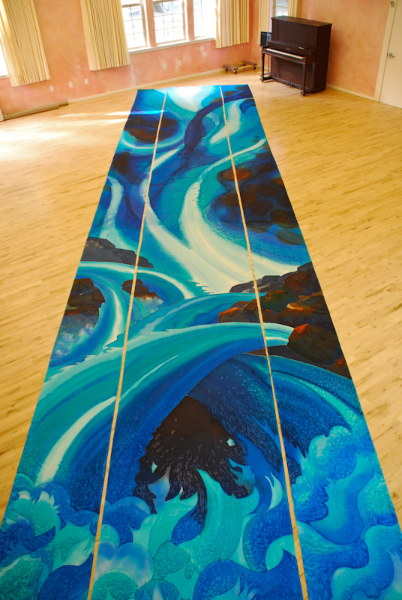 This weekend I took the 3 silk panels back to the school gym floor and unrolled them to check finished size and appearance. I am very pleased with the final layers of dye, and think that the goal of a sense of “power” and “mystery” translates very well. I measured everything, and with cutting, rolling, painting, washing, steaming and shrinkage, the panels are very very close to the desired size. The center panel is one inch longer than the other two (difference in shrinkage), and when the panels are side by side with no gap they measure 8 feet by 6 inches exactly, top and bottom, which is what we were shooting for. The picture below shows the scale of this project, when you see the piano in the upper right hand corner. I have hemmed the 216 feet of the side edges of the panels, and am about to make the 12 foot slit in the center panel so it can open for the immersion baptismal pool behind the panels. Then I’ll take the 4’x 15″ rectangle out of the top middle of the center panel to make room for the beam in the ceiling, then hem both of those. Also, all the tops of the silk panels will have sleeves for a rod, to be hung either from the wall or from the underside of the beam. I will lastly put sleeves in the bottom of all the panels in casewe want to run a rod through those too, for stabilizing. To see full pictures, click on one of the thumbnails below. Here you can see the set-up I use to steam my silk. 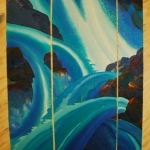 I am steaming “Zion’s Waterfall”, which consists of three silk panels: two are 37 feet by 28 inches, and one is 37 feet by 52 inches. The widest panel is being steamed in the tallest stovepipe, and one of the narrower panels is in the shorter stovepipe. 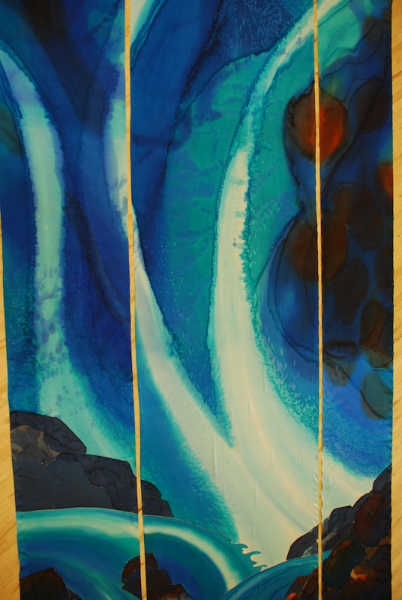 River Theme for a Northwest Church, which shows the first attempts at a waterfall design, too realistic for the client; Waterfall Update, showing watercolor sketch of a more abstract design; next is Preparing for a Large Project on choosing colors, making the frames, and practicing; and Zion’s Waterfall 3/4 Done where you can see the 37 feet of painted silk rolled out on a big floor to see how it looks so far. To steam the silk it is first rolled up in newsprint and brown wrapping paper, making sure there is room on the top of the roll to drill a hole through the top inch. I stick this paper/silk roll inside the stovepipe, then thread a wire through holes in the top of the stovepipe and the drilled hole through the paper roll. 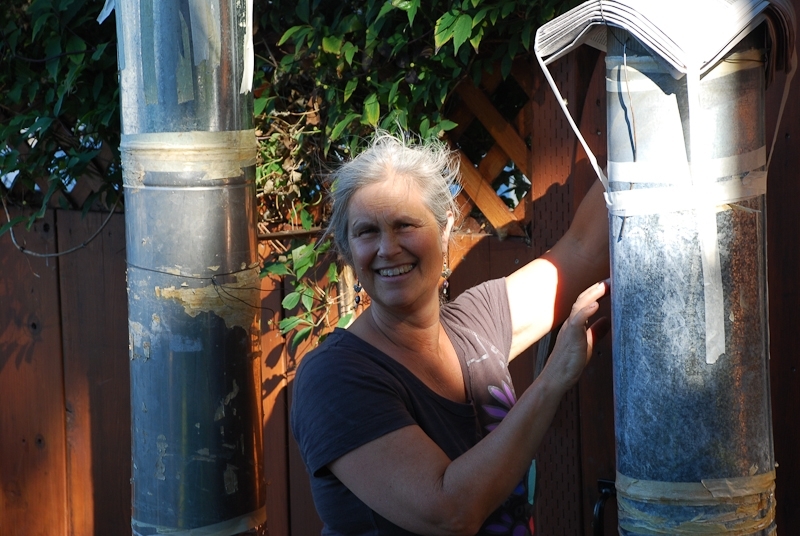 Now the stovepipe can be upended, with the paper roll hanging from the wire inside the stovepipe. Next I stick the whole affair into a hotel-sized pot on a propane burner, fill the pot with water, seal the space between pot and pipe with aluminum foil crimped under the rim of the pot and taped with masking tape to the pipe, so there are no holes for steam to escape. I light the burner, and let the water boil and make steam for 3-5 hours, depending on how thick my roll is. Oh yes, the lid on top of the pipe is 1-2 inches of New York Times papers, procured from local co-op’s recycle bin, secured with masking tape to the top of stovepipe. Somehow it all works! I can tell if the steaming is successful in two ways: that the colors are more intense than before steaming, and when hand-washing (next step after steaming) that clouds of excess dye do not wash out of the silk, but just a little bit of dye that is not bonded to the silk. If you want to do this process yourself there are more details to know for success. For now I can suggest Susan Louise Moyer’s book “Silk Painting” where you will find complete directions. I’ll write complete instructions later this summer for those interested. Working on a project that is 36 feet long when you only see 9 feet at a time can be tricky. I’m working on 3 wooden frames that have rollers on each end, so when I’m done with the first 9 feet I roll the fabric down to the next 9 feet. Today I got a chance to roll it all out, all three panels side by side, on a big floor at a school so I can see it all at once. This is the only way to check on how it’s going and what changes still need to be made. It’s hard to get a good picture of something so large. In both of these pictures you can see that the perspective is foreshortened, so it is hard to see the whole thing properly. Even when the panels are hanging vertically on the wall where they belong it will be challenging to get a good photo. Guess you will just have to see it in person! 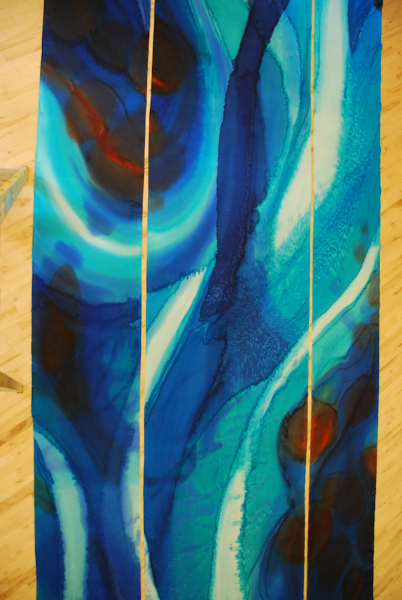 Upside down “Zion’s Waterfall, 36 feet by 8 feet, silk dye on silk, 3/4 finished. See how different it looks upside down? The white area will be the very top of the painting. The piano is at the bottom of the piece. In the next picture you see the very top of the piece, and I’ve selected some shots that take you down the whole length, so as you scroll down you can see some more of the detail. Remember that it’s not finished yet…this view of the whole has left me with a list of things to take care of. The area in the picture below is where I will be doing the most touch-up work, as far as fixing things go. This area needs some simplification and unification. I have a plan (check back to see how I do this). Below you can see that the rocks, and the waterfall below the rocks, are the least developed of the project, since I am working from the top down. Can you see that the colors and textures are not as rich in the lower areas? It’s amazing what just one more layer of dye will do, to add variation and saturation. The rocks will be darker in value, maybe as dark as black, but I want to keep some of the color variation in these rock shapes. And the water in the lower waterfalls will be rich too, with more interesting lines and textures, sort of like what you see below. I really like making good use of what the dyes can do. It’s a matter of knowing your materials very well, and what happens to them in different circumstances. 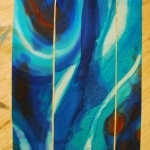 I’ve used layered dyes to make interesting lines, painted with water to push the paint around, used a watercolor technique of transparency, and blended colors to make soft edges. I’ve used some gutta resist for sharp edges and keeping one section of dye from another, lots of salt, and lots of prayer. And finally, here I am in my studio-to-be, with the silk on the frames. Now that all the silk is covered at least once the major decisions are done and the great share of the work is over. Now comes the very most important part of the painting: Tuning it up to make it just right. The more preparation a person does before a big project, the greater confidence one has in what might happen when the color hits the ground. 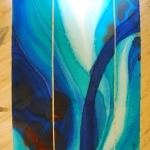 This project will be 36 feet by 8 feet, silk dye on silk, of a waterfall. The design is monochromatic, that is, mostly blues and very little else, so I will have to depend to a great degree on value (lightness and darkness) to carry the piece. I also ordered some new colors of dye, so I had plenty of nice rich blues to work with. Since I ordered new blue dyes that I’ve never used before I wanted to see how they react with the dyes I already have, so I made a new color chart that includes the new dyes. Now I know what a color mixed with any other dye will look like. On the right you can see the watercolor pigments I used to make the watercolor sketch I am using for the silk painting. It is these colors I wanted to find equivalent dyes for. 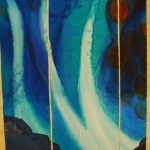 Above is the watercolor sketch of the waterfall, turned on its side. Look carefully to see the gridding on the sketch. Each line represents one foot. 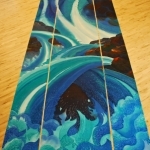 The waterfall will be 36 feet long, in three pieces: one 4 feet wide, and two 2 feet wide. You can see the long pen lines marking where the sketch is divided into 3 parts, wider in the middle and narrow on each side. Hanging below the sketch is my chosen palette! The color scheme is simple, with blues from light to dark, and from greenish to more purple-ish. Then I added in the complement of blue, orange, in an earthy tone, both lighter and darker. And also a black to punch up the value, if needed. Here above is the waterfall sketch, with a grid on tracing paper that I can lay over the sketch. It is carefully drawn to size, so I know how wide each panel will be, where the beam in the ceiling will intersect with the silk, and how high the 12′ slit in the bottom will be on the design. Why the slit? To pull back each side like curtains to reveal an immersion baptismal pool! My husband made me these wonderful frames to stretch the silk on for painting. 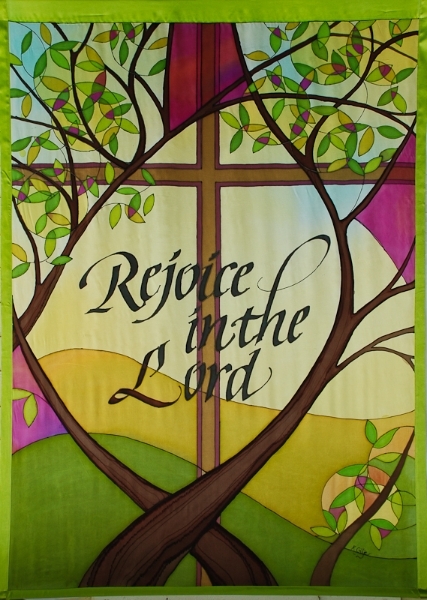 You can see two narrower 2′ wide frames and one 4′ frame in the center, with silk stretched on them. He made rollers on each end of the frames, so I can work on just 9 feet of the 36-foot length of silk at once. I marked each foot of each piece of silk, so I can paint them side by side, knowing I’m in the right area. Also note my wonderful studio, which is being built on weekends. Soon there will be an arched window overlooking the bay, and an opening skylight. We put in a floor and a staircase to get to the attic last fall, insulated this spring, and this coming fall we will put up dry wall and paint the walls white. The distance from the floor to the peak is 11 feet! It’s a wonderful place to work. Keep an eye on this blog. I’ll be taking you through this whole process as it progresses. Also see the previous entries to get the full story on this project! A few weeks ago I introduced you to a current project and promised to keep you in the loop as it develops (see earlier post). 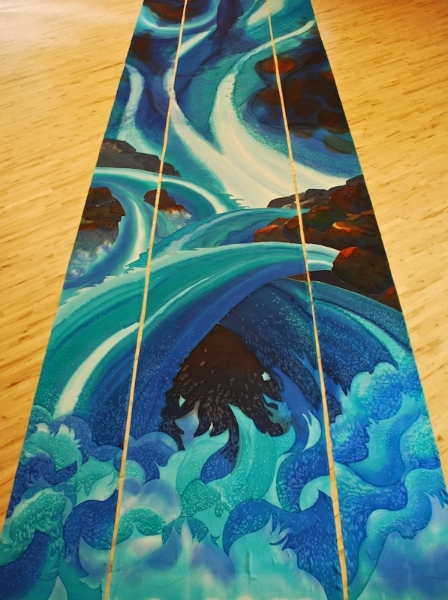 The theme for this project is a vision from Ezekiel 47 (and repeated in Revelation 22), of the river of the water of life, flowing from the throne of God, bringing healing, wholeness and life to all. 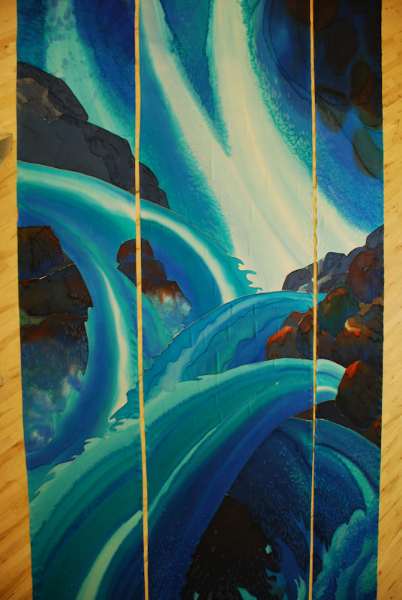 We are starting with a 30 foot long painting of a waterfall. This is a congregation of immersion baptism, and a baptismal pool will be behind this waterfall. !!! For a baptism, the lower 12 feet of the banner will be drawn to each side, like curtains, to expose the pool and the drama of the baptism. I like how the vertical water, flowing from the throne of God, is powerful and mysterious. This congregation has pushed me into a more abstract interpretation of “waterfall”…my painting tends towards realism when I work with landscape. As you can see below and to the right, which is my first attempt at the design. 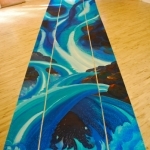 When I brought this first and more realistic design into the sanctuary and we imagined it 30 feet tall it became readily apparent that the image would be overpowering. It’s a nice little sketch, but that white cone of a waterfall is just too strong, and too literal. “No scope for the imagination” as Ann of Green Gables would say. 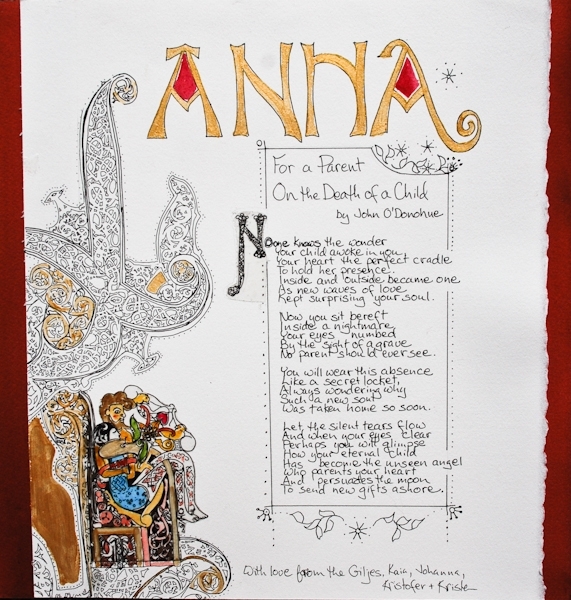 Just like a good poem, you don’t want to say it all, but instead leave room for the text to work, for instance, or the Spirit. My clients, a pastor and a worship leader, asked for more abstraction, so I went home and tried my hand at it. I actually did about 6 of these, trying to make it work. But they all ended up pretty wimpy looking. Sound panel sketch, 3rd down from the top in the waterfall. Can you find it there? In the end, not happy with any of the second batch, I went back to a sketch originally for the 26 sound panels that are to be covered with silk also (more on this later). I put those together and turned them vertically. It worked! Powerful, majestic and magical, in my humble estimation. This original design simply “came” to me, for the sound panels. If you look back at the first picture, you can see the waterfall is made up of several horizontal pieces of paper. The one shown to the left here is the 3rd panel from the top, in the waterfall. Can you find it? Each of these pieces is to potentially be a covering for the 26 sound panels, 8′ x 4′ each, that surround the walls of the sanctuary. We shall see if the project continues into this chapter. For now, it’s enough to make this big waterfall! In the next days I’ll post pictures of what it looks like in my studio when I actually start making these. As you can see, there’s a lot of planning that goes into the design process. It’s actually the hardest, and most important, step of the whole process. “Then he brought me back to the door of the temple, and behold, water was issuing from below the threshold of the temple toward the east (for the temple faced east). The water was flowing down from below the south end of the threshold of the temple, south of the altar. 2 Then he brought me out by way of the north gate and led me around on the outside to the outer gate that faces toward the east; and behold, the water was trickling out on the south side. I’m preparing my “Butterfly Collection” body of work, all silk dye on silk, for a solo show July 1 through August 31, 2013 at Brandywine Kitchen, 1317 Commercial St., Bellingham WA . Here’s a link to their web site: http://brandywinekitchen.com/. Some of the butterflies have already sold, so I’m making several more. Here are the first two. Be sure to come and see them in person! Take one home! On the death of a young woman, the daughter of good friends and a student of mine, her community was asked to make pages for their family’s “memory book.” My mind and heart focused on the grief Anna’s parents must feel on this inexplicable and senseless accident.